At the 2015 Tokyo Motor Show, Mazda unveiled its most talked-of concept Mazda RX-Vision Concept 2015. As anticipated the concept features a stunning exterior body, no-nonsense interior and powerful engine. The amalgamation thus narrates a sportive model that is meant to perform. 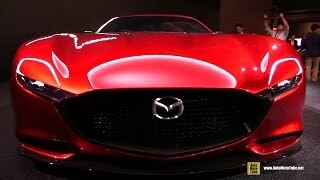 Let us have a closer look at the details through Mazda RX-Vision Concept 2015 review. The interior of Mazda RX-Vision Concept 2015 isn’t like the most of the concepts we see today. It has a simple and clean interior. Starting with the dashboard where you have a simple instrument cluster featuring three-round gauges while the center console has just a ‘Start’ button and a gear shifter beside the parking brake lever. This doesn’t means that company compromised with the sports features. There are sports seats featuring heavy bolstering while the three-spoke steering wheel doesn’t have any sportive integration and comes wrapped in black leather with red piping and stitching. The essence of contrast further spreads its wings to the seats and door panel in form of black and red work. There is large amount of leather and aluminum inserts. 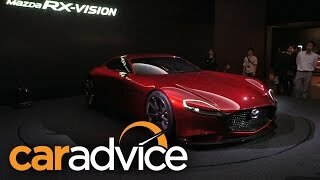 In all the interior of Mazda RX-Vision Concept 2015 is simple and clean, however we expect the production version to come with a multi-function steering wheel and few more features. The exterior of Mazda RX-Vision Concept 2015 is extreme opposite of the interior and features an aggressive sportive body. 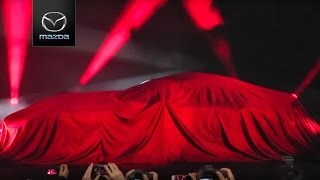 Starting with the front fascia, the model has a massive grille with black trim that extends till the headlamps. The headlights feature a slim look and this stance make the front end look aggressive. Beneath this the apron features slender intakes and a splitter made from carbon-fiber. Moving towards the rear end, you’ll be noticing simple lines across the side. The rear end has simple design elements. It is elegant with a carbon-fiber diffuser and massive round exhaust outlets beneath. There are no character lines or extra additions to give the touch of sportiness or aggression. Even the taillights look clean and are intended to just splatter the light. 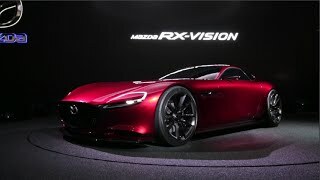 However the overall exterior of Mazda RX-Vision Concept 2015 to me appears as a stunning creation and I believe this to capture the hearts of good number of buyers. 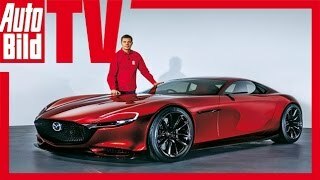 Nothing has been talked about the power delivery of Mazda RX-Vision Concept 2015 but company does shared that there will be a SkyActiv-R engine beneath the hood. We expect the engine to be a turbocharged one delivering the output sufficient to drag the vehicle at an acceptable speed. The performance figures of Mazda RX-Vision Concept 2015 are presumed to be bit high looking at the design and the lightweight inclusions but for now we do not have anything from the company’s side.